Dr Harry Morrow Brown is one of the oldest doctors still practising in the UK, and has no plans to retire. Aged 91, he despairs of how he would spend his time. "If you didn't know what to do with your day, it would be dreadful, awful," he warns. Dr Morrow Brown is still active, running allergy clinics from his home in Derby, as well as still publishing in academic journals, and inventing machines to measure air quality. He's one of a tiny but growing group of people I've been researching, who are still working way past the normal retirement age. According to the Office for National Statistics, the number of people aged over 80 who are still economically active has soared in recent years, increasing by 40% to 21,000, since 1999. Dr Morrow Brown is scornful of people who give up work. "If you're physically able to do it, keep on doing it," adding: "If you don't use it, you'll lose it." 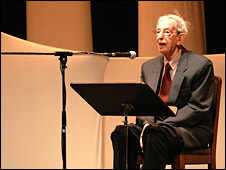 The historian Eric Hobsbawm shows no sign of easing up, even though he will be 92 in June. As prolific as ever, he has had two books published in the last nine months. When he addressed the Hay Festival last summer, fellow historian Simon Schama introduced Mr Hobsbawm as the man who "defined agelessness". Keith Frost, spokesman for The Age and Employment Network (TAEN), says the older people get, the longer they want to keep working. "If you do a survey of 25 to 40-year-olds, they want to retire at about 55. If you talk to people over 55 they want to keep working beyond retirement age." And it appears that money is not the only reason why people want to carry on working. A recent survey of working 55-year-olds conducted by Mori for the Department for Work and Pensions found that 57% continued to work because they enjoyed their jobs. Pensions Minister Mike O'Brien commented: "Many of today's older workers are rejecting the cliff edge between work and retirement in favour of a gradual step down." 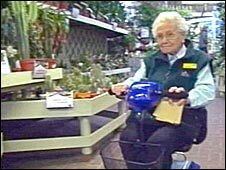 A gradual step down is one thing, running a garden centre when you've reached your centenary is quite another. 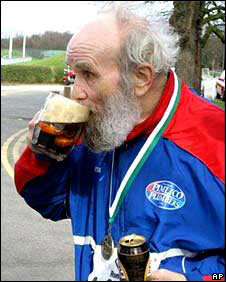 At 100, Phyliis Self can claim to be the UK's oldest manager. She is the personnel director of a garden centre founded by her son in Lacock, Wiltshire. She only joined the firm when she was 65, and still drives herself to work every day. "It makes me feel grateful that I am still capable of coming to work," she said on her birthday last November. But the accolade for the oldest employee in the UK must surely go to the extraordinary Buster Martin, who will turn 102 in September. Mr Martin did retire aged 97, but found his joints were stiffening up, so he took a job cleaning the vehicles at a plumbing company in London. "If you enjoy the job, and you've no hassle, why not keep working?" he asks. If further proof were needed of his fitness for work, Mr Martin will this weekend compete in the London Marathon, having already successfully completed a 13-mile training session. Although he cannot promise that he will complete the 26 miles, he says he will "give it a try". Colleagues at work say he even stands a chance of achieving his goal. Britain doesn't have the monopoly on energetic nonagenarians. The American guitar legend Les Paul originally retired from the music business in 1965, having pioneered a new multi-tracked guitar style in the 50s. But he has recently returned to work on the advice of his doctor, who said it would help him recover from by-pass surgery. "That's what's going to keep you alive," the performer was told. Now aged 92, the guitarist plays regularly in a New York City jazz club, and even recently released a new album featuring younger admirers like Eric Clapton and Jeff Beck. Bluesman Pinetop Perkins is another musician defying the years. He made his name playing piano behind the R&B legend Muddy Waters. Now aged 94, Perkins will release his latest album this June, and also continues to play shows across the States.